Several types of switching regulators exist, classified from different perspectives. In this section, starting with types of input power supplies, an attempt will be made to categorize them principally by circuit type. First, switching regulators can be divided into DC/DC converters and AC/DC converters, depending on whether the input power is DC (direct current) or AC (alternating current) (see Figure 27). “DC/DC converter” means a regulator that takes a DC voltage as input and outputs a DC voltage by conversion, and “AC/DC converter” means that which takes AC input and converts it to a DC voltage. The DC/DC converter and the AC/DC converter each comprises non-isolated and isolated types. In the isolated type, the input (primary) and output (secondary) sides are isolated mainly by using transformers. Isolated types are typically used in industrial and medical instrument applications where safety in the event of a malfunction is vital importance. The non-insulator type provides electric conduction between the input and output. Most of the converters used in the same circuit board not requiring isolation are of the non-insulator type. Because there are suitable circuit systems for construction of non-isolated and isolated converters, switching regulators can be classified by circuit type. In Figure 27, the synchronous rectifying and flyback refer to circuit types. These systems differ in constituent components, circuit size, and underlying operating principles. 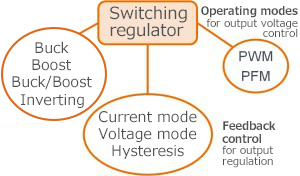 Switching regulators can also be classified in terms of functions and operating methods, as shown in Figure 28. Because the AC/DC converter, after rectifying and smoothing of the AC voltage at the initial stage, basically operates in the same manner as a DC/DC converter, the discussion that follows will be based on DC/DC converters. A DC/DC conversion can step down or step up the input voltage. As an extension of this capability, buck/boost and inverting conversions are also possible. 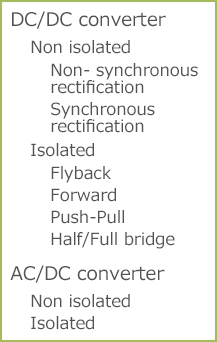 Depending on the specific function to be achieved, a buck converter may be selected, with different circuit configurations and ICs adopted. Pulse Width Modulation (PWM) and Pulse Frequency Modulation (PFM) are among the operation modes to control the output voltage. PWM provides regulation by adjusting the on/off time ratio at a constant switching cycle (frequency), whereas PFM uses a fixed on/off time ratio and a variable frequency, as will be discussed in detail later. Also, a current mode, a voltage mode, and hysteresis (or ripple, or comparator) control mode are among the available feedback control methods designed to regulate the output. These will also be discussed later. Switching regulators are configured by a combination of these elements. The optimal combination must be selected based on the intended application, input/output conditions, design specifications and performance goals, cost, size and other restrictions to be met. The designer needs to know the characteristics and pros and cons of each element. ・The switching regulator comprises AC/DC and DC/DC converters, which in turn may vary in the conversion methods employed. ・To select the best possible combination of elements, the designer needs a solid understanding of the advantages and disadvantages of each method.